VERY FINE APPEARANCE. ONLY 19 SINGLE USED EXAMPLES OF THE 6-CENT 1917 ISSUE PERF 10 AT TOP OR BOTTOM ARE RECORDED IN OUR CENSUS, OF WHICH ONLY SIX ARE CONFIRMED AS SOUND. 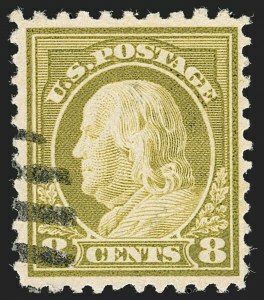 Our census of Scott 506a, available at our website at https://siegelauctions.com/census/us/scott/506a , contains 21 certified used copies, including two with transitional perfs in a block. Most have faults ranging from pulled perfs to creases. Only seven singles do not have precancels. 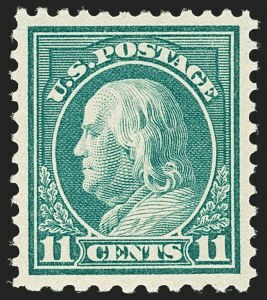 The example offered here, with transitional perfs and a duplex cancel, is particularly desirable. VERY FINE AND CHOICE. AN EXCEEDINGLY RARE SOUND EXAMPLE OF THE 8-CENT 1917 ISSUE PERF 10 AT TOP, WITH A FACE-FREE POSTAL CANCEL. ONE OF THE FINEST OF ONLY 22 EXAMPLES RECORDED IN OUR CENSUS. Our census, available at https://siegelauctions.com/census/us/scott/508c , includes 22 used examples (none are known unused). Ten have postal cancels, and of these only five are confirmed as sound. Perhaps two or three other postally cancelled copies compare favorably the example offered here. VERY FINE APPEARANCE. 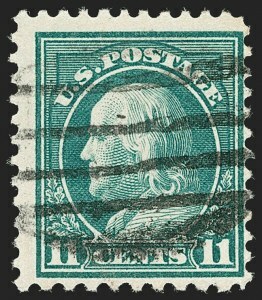 A RARE POSTALLY-CANCELLED EXAMPLE OF THE 1917 9-CENT PERF 10 AT TOP. ONLY 32 USED EXAMPLES ARE RECORDED IN OUR CENSUS, AND ONLY FIVE HAVE POSTAL CANCELS. Our census of Scott 509a, available at our website at https://siegelauctions.com/census/us/scott/509a , contains a total of 32 used and one unused example of this rarity. 27 of the used copies are precancelled. EXTREMELY FINE GEM. A SUPERB EXAMPLE OF THE 1917 11-CENT FRANKLIN WITH PERF 10 AT BOTTOM, IN THE FINEST CONDITION ATTAINABLE. THIS MAGNIFICENT STAMP IS GRADED XF-SUPERB 95 BY P.S.E. 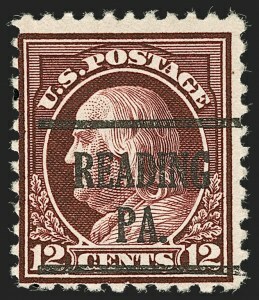 FINE APPEARING USED EXAMPLE OF THE 1917 11-CENT PERF 10 AT BOTTOM. SCARCE WITHOUT A PRECANCEL. 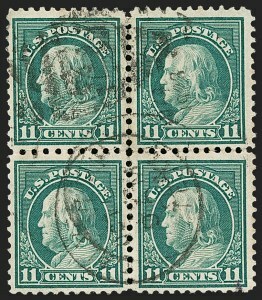 THE UNIQUE USED BLOCK OF FOUR OF THE 1917 11-CENT WITH ALL FOUR POSSIBLE PERF 10 ERROR VARIETIES. ONE OF THE MOST OUTSTANDING RARITIES OF 20TH CENTURY PHILATELY. Many examples of the Perf 10 on One Side rarities show transitional perfs from 10 to 11 or from 11 to 10. 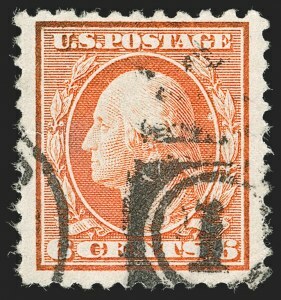 This is because the out-of-gauge perforation pins would frequently cross the span of more than one stamp. Depending on where the wheel contacted the sheet, it is possible for surviving multiples to show a combination of Perf 11 and Perf 10 stamps or transitional perfs on one stamp. The four possible varieties are Perf 10 at top or bottom and transitional Perf 10/11 at top or bottom. 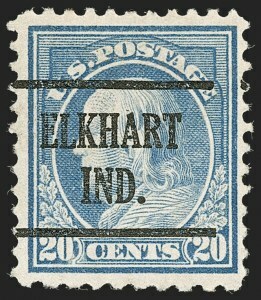 This block is remarkable as the only certified example with all four varieties se-tenant and no normal stamps. The Galveston duplex cancel, rather than a precancel, only adds to its rarity. FINE. AN EXTREMELY RARE SOUND EXAMPLE OF THE 1917 12-CENT PERF 10 AT BOTTOM. ONE OF THE RAREST OF THE PERF 10 ON ONE SIDE VARIETIES. 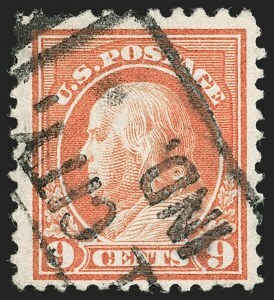 Our census of Scott 512b, available at our website at https://siegelauctions.com/census/us/scott/512b , contains only 16 used, one on cover and four unused examples of this rarity. Only five used examples are confirmed as sound; eight have faults and three need to be reexamined for condition. VERY FINE. A RARE AND DESIRABLE SOUND EXAMPLE OF THE 1917 20-CENT PERF 10 AT BOTTOM. ONLY THIRTEEN ARE CONTAINED IN OUR CENSUS. Our census of Scott 515d, available at https://siegelauctions.com/census/us/scott/515d , contains only thirteen used examples. Nine have precancels and this is the only example we record with the Elkhart Ind. precancel. Census No. 515d-CAN-09. With 1980 and 2009 P.F. certificates. The Scott Catalogue states in a footnote to this issue, "Valued in the grade of Fine."